Taylor County doesn’t have the “flats market” cornered. In fact, on the Big Bend we have just one huge grass flat along our Natural North Florida coast. . Taylor County’s 40-mile stretch, from Steinhatchee north to mouth of the Aucilla River, is just a fraction of the available fishing territory. And, if I had to pick a season to drift over grass flats and fish for seatrout, I’d pick fall. The Gulf waters are beginning to cool down after what was an oppressively hot summer, and the fish are feeling the need to eat and pack on weight. They know winter is just around the corner! 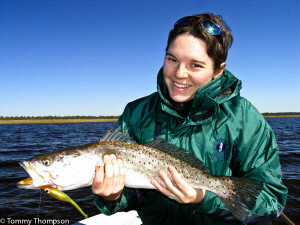 Taylor County is know for it’s excellent seatrout fishery. Taylor County’s two major ports are Steinhatchee and Keaton Beach. There are ramps at Yates Creek, Spring Warrior Creek, the Econfina River and the Aucilla River, north of Keaton Beach, but understand that they’re small-boat friendly. From Steinhatchee, the coastline runs northwest, and it’s pretty safe to navigate the one-fathom (6-foot) curve on your Florida Sportsman Steinhatchee (#20) Chart or on your chartplotter. Inside this curve, and all along this coast, you’ll find abundant beds of lush turtle grass, mixed with deeper patches of sand or cuts that are remnants of ancient creek beds. These spots of mixed grass and sand, along with mixed depths, are traditionally the best spots for fall fishing—and the spots that have, over the years, made Taylor County famous for its seatrout fishery. From Steinhatchee, consider drifting the 3 to 6-foot flats and cuts off Dallus Creek and Clay Creek. Or, if you don’t mind running a few more miles, try the flats northwest of the Bird Rack that’s south of Big Grass Island. Of course, these areas are also easily reached running south from Keaton Beach, but don’t overlook the possibility of the flats off Dekle Beach and Yates Creek, to the north. And if you plan to run to the (lonesome) north end of the county or to launch your small boat at Spring Warrior, Econfina or Aucilla, there are vast flats there, plus structure around the Rock Islands, near the mouth of the dark-water Fenholloway River. Trout are not the only fish on the coastal flats of Taylor County. Nice redfish live there, too! Tackle and baits for fall flats fishing is pretty simple. The main species here are spotted seatrout, bluefish and Spanish mackerel. And an occasional redfish will also venture away from shore to feed on the flats. Light to medium spinning gear or baitcasters are all the hardware you need. I prefer 2500 to 4000 class spinning gear, spooled with 8 to 15-pound braided line, especially if I’m tossing artificial baits, like subsurface plugs (MirrOlure Catch 2000s) or free-lined soft baits (D.O.A. 3-inch shrimp). This rod-and-reel combination telegraphs strikes well, making hookups easy. If you plan to fish using popping corks, a common sight on these flats, you can get away with the stretchiness of monofilament line—just be careful to keep the line’s slack to a minimum. The advantage of fishing Taylor County’s coastline in fall is that it’s easy and folks of all ages and skills can enjoy catching fish. By the time you read this, recreational bay scallop season will be over and the crowds will have dwindled, making this the perfect place for an October adventure.